Contents1. Theoretical, Feasible, & Practical 2.G-force Velocity: Light Speed Remainder3. G-force Distance: Use a Little Calculus4. Ship's Mass Half Life5. Newton had a point; Einstein liked his point so well that he improved upon it. Wormholes and warp drives are theoretically possible; but noone has even tried to develop required technology to make them happen. We can certainly imagine them, but we don't really know if it's possible to make the technology. Solar sails and generational space ships are much closer to reality, but they both take a long, long time to get anywhere. That's not practical. Ion drives would make spacetravel practical; though far from easy. Thought Experiment assumes following equation from Einsteinian concepts to approximate g-force speeds for interstellar flights. From above assumed values, we can compute following: After one day of g-force acceleration, spacecraft reaches a velocity of .489 AU/day. Convenient values and Newtonian formula might work for relatively short interplanetary distances. Δ - Daily velocity increase remains a constant 0.489 AU/day ≈ 0.283% c.
The margin that our propulsion system gave us for interplanetary flights quickly disappears for interstellar. 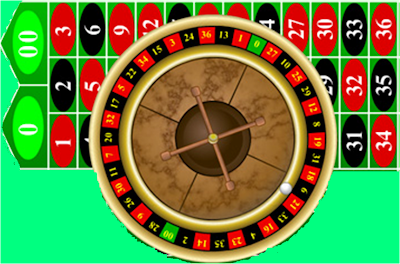 The distances are too vast and the flight durations are too great; thus, we cannot get by with the convenient heuristics used for Volume I.
Probability of rolling a double zero on first roll is very low. First day of g-force flight increases ship's velocity to a very small percentage of c.
As number of rolls increase, probability of a double zero increases. As number of days of g-force flight increase, g-force velocity increases. As number of rolls increase, complement of double zero decreases; this is easily computed with exponentials. As g-force flight duration increases,decreasing light speed remainder is easily computed with exponentials. 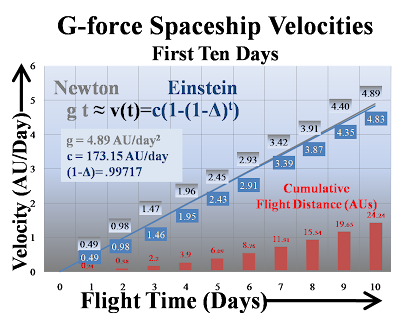 For initial 10 days of g-force acceleration, Newtonian equation approximates values determined by the Einsteinian. 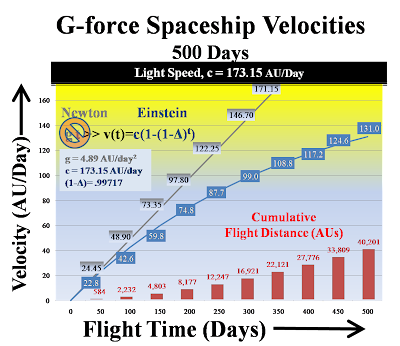 For tenth day, both equations show velocity of just under 5 AUs/day and a total distance of just over 24 AUs. This contrasts enormously with a more general chart which shows greatly diverging values for a g-force spaceship accelerating for 500 consecutive days. Newton's equation is no good for larger values ; on above chart, Newton's equation (g* t) shows spaceship going through light speed after a year. On the other hand, thought experiment assumes an Einsteinian version is adequately modeled by an exponential equation which shows at 500 days, a velocity of 131 AUs/day and a total distance of about 40,000 AUs (≈ 2/3 LY). It's very likely that most if not all interstellar missions will require many years of of constant speed (thus, zero g) flights. Reasons: likely not possible to carry sufficient fuel to power entire flight. ---Arrival Phase: At same dist from destination, use same amount of fuel to slow down to operational speed. ---Very important consideration. Constant comm stream with Mother Earth. Not only is this desirable for many reasons, consider this overwhelming factor - if this ship encounters unexpected hazards (large debris such as ejected comets and asteroids, rogue planets, brown dwarfts, singularities) the time of communications termination will alert mission planners that future trips to that stellar destination will require even more caution then usual. For these years at constant speed flight, it's untenable to consider constant zero g conditions. Thus, structure must be cylindrical and large enough so that introducing a slight spin will impart g-force to inside of outer hull as well as able to provide comfortable conditions to a fully large human population (at least 10,000 souls) as well many types of flora/fauna. However, humans should have had plenty of experience with this type of vessel, because this is exactly what has been suggested for many interplanetary missions.